The Japanese version of Bethesda's hit RPG Fallout 3 has apparently been edited to remove material "inappropriate" for a videogame in that country. Along with the usual localization tweaking, Bethesda has announced that two notable changes have been made to the post-nuclear RPG in Japan. 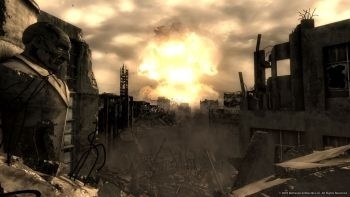 First, the Mr. Burke character has been removed from the game entirely, along with the quest to detonate the nuclear bomb in the town of Megaton, and second, the name of a weapon has been changed as it was inappropriate for the Japanese market. The weapon in question isn't actually named, but the obvious choice would be the Fat Man, a handheld tactical nuclear weapon. I shouldn't have to explain why this might be a bit of a sticky issue in Japan, but for the benefit of those who slept through history class, Fat Man was the code name for one of the two atomic bombs dropped on Japan during the closing days of the Second World War. Fat Man devastated the city of Nagasaki, killing between 60,000 and 80,000 people and leaving countless more ravaged by fallout and radiation. To this day, Japan remains the only nation in the history of the world to suffer the brunt of a nuclear attack. According to Kotaku, however, the reaction to the changes among Japanese gamers seems to be "largely disappointment." Perhaps those old scars aren't as sensitive as we might think? Fallout 3 goes on sale in Japan in December.